I am so excited to tell you all about a website I came across, that I'm addicted to now. Pick Your Plum has new deals each day for amazing prices and they are available for 3 days or until they sell out. They have some really great items for cooking, kids, and crafting. I check every day when new items are added, if you sign up for their e-mail you'll get a notification each day of what new deals are being offered. So, when I saw Pick Your Plum was offering a Clothing Grab Box for $5.99 and it was advertised to contain 6-10 items, I knew it was worth trying. 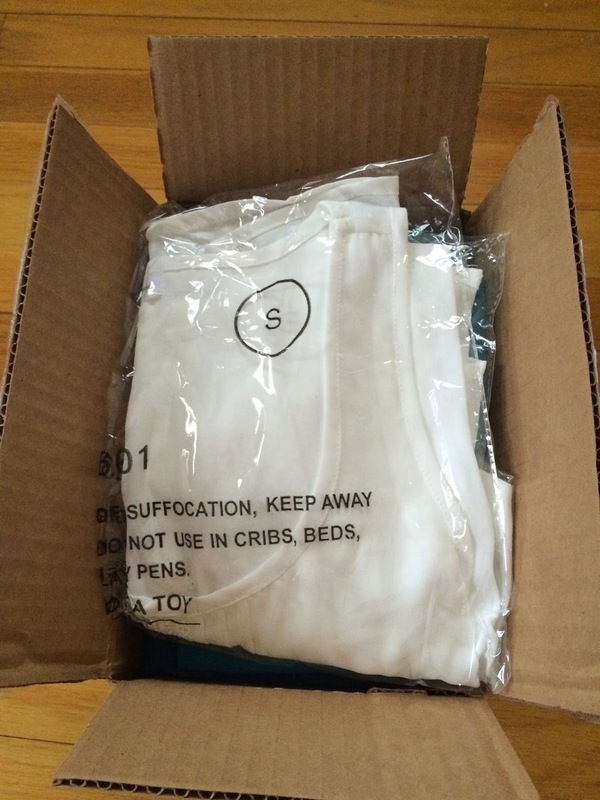 I had no idea what to expect, but I thought even if I received a few t-shirts, it'd be worth it for that price. They have a flat rate shipping cost of $4.99, so my box of clothes came to about $11. And when it arrived on Friday I couldn't wait to see what was inside. The box was very small (9x6x6) and I was skeptical that 6-10 items could even fit inside. I was expecting a larger box. When I opened it up, it was definitely full and even had a piece of Laffy Taffy on top (which was eaten before I took the picture, haha). I have a weakness for candy! And the item on top looked very promising and cute, so I was excited to see what else was in the box. As I pulled each item out, I knew it was perfect for me. 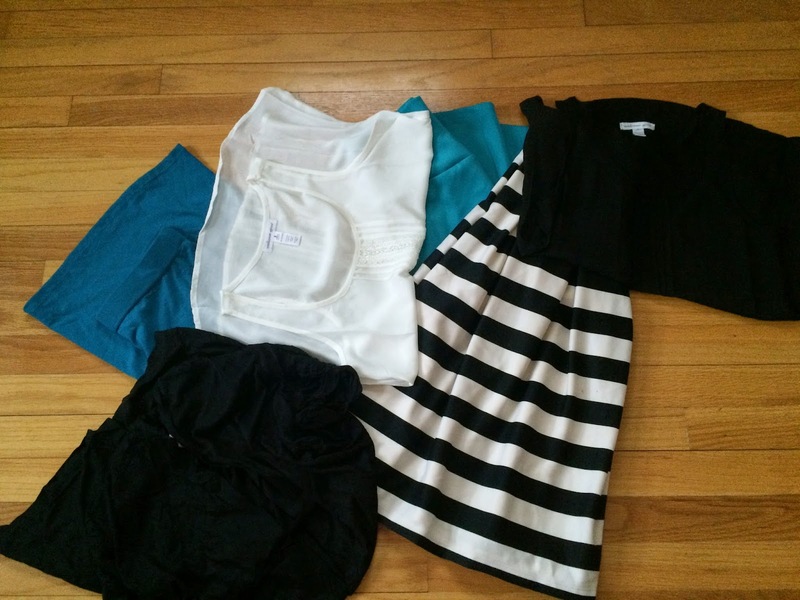 I received 6 clothing items (plus the piece of Laffy Taffy), making it cost about $1.85 per item (including shipping cost)! They were all pretty basic items, that I knew I'd wear as long as they fit. And I loved the colors I received. I was very pleasantly surprised by what was included and it was well worth the $11 total I paid for the box. I couldn't wait to try everything on to see how it all fit. Here is a picture of my pile of clothes that were in that tiny box. Can you believe it?!? For $10.98!!! 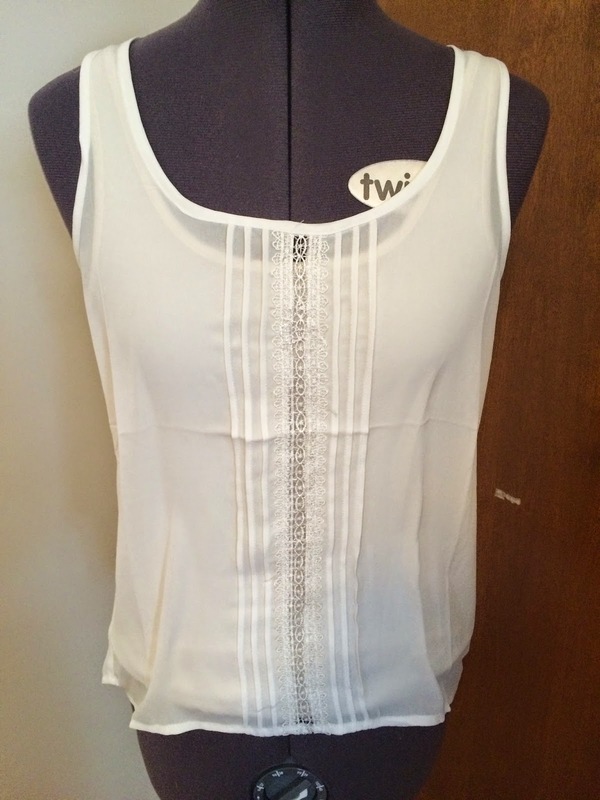 The first item I pulled out of the box, was a white tank top with pleating and lace detail down the front. This is perfectly my style and I was so excited to see something so cute included. I knew immediately I would wear it. It fit me perfectly! And this looks like something I would have paid more than $10 for in the store!!! And it's definitely something I would have purchased for myself. After seeing just one item in the box (and eating the Laffy Taffy), the purchase was worth it for me, because I loved this shirt! 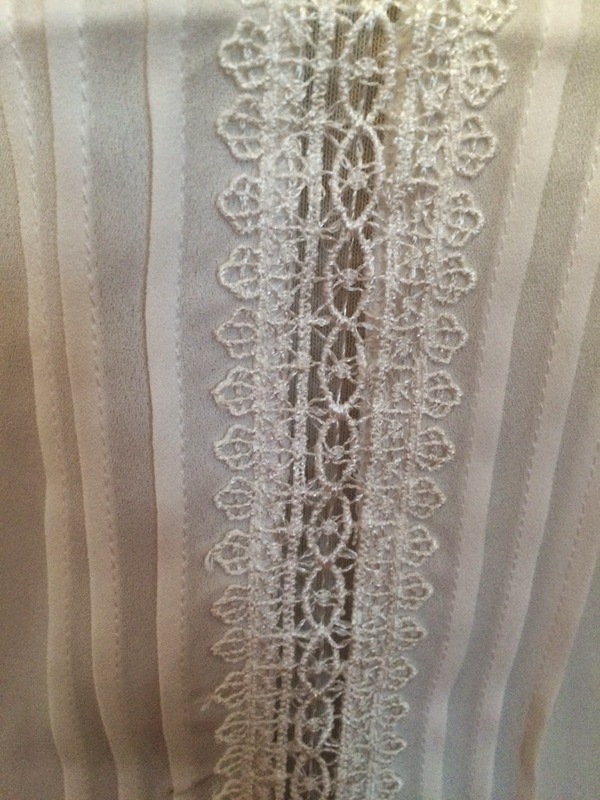 This is a close-up of the detailing in the front. The next item I was a bit worried that it wouldn't fit because it looked very small. 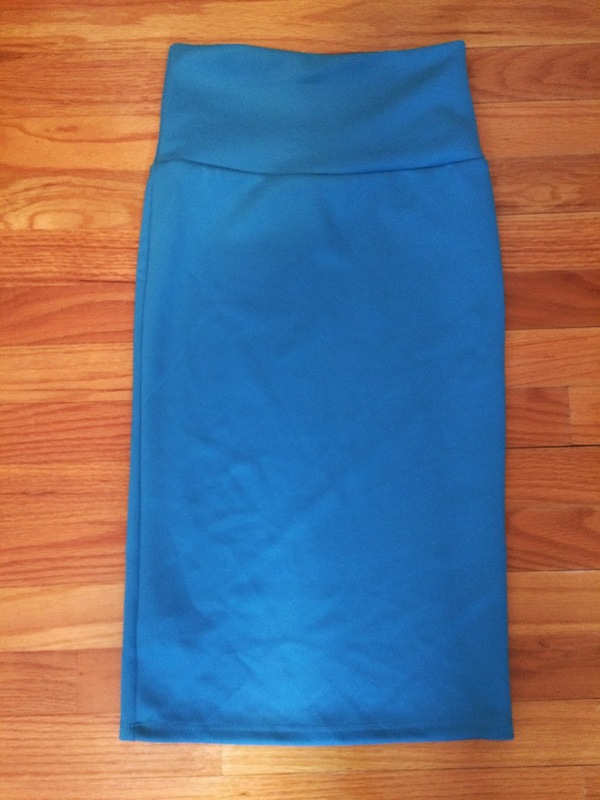 It was a blue knee length pencil skirt. I was hoping it would fit, because it was a color I knew I would wear a lot, and it'd look great for work! 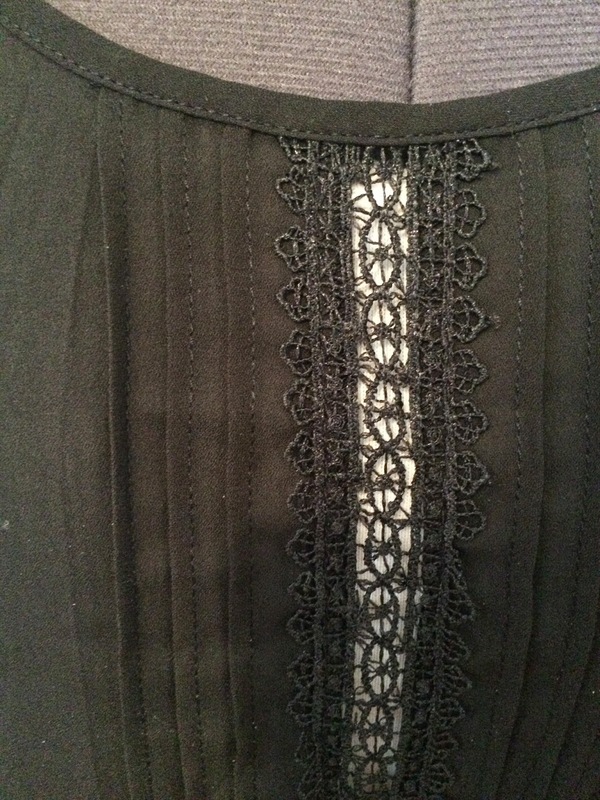 It has a thick band at the top that I think you can wear up or down. When worn up, it looks like a high-waist skirt. And rolled over once, it has a normal waist. It fits form fitting, but doesn't feel too tight, so I'm going to try to wear it, because I love the color and it feels really comfortable. This picture is the skirt laying flat, because it was too form fitting for the dress form (and I was too lazy to take styled pictures). The next picture is me wearing the skirt, but you can't see much of me (you can tell I live in the arctic cold this time of year, by how pale my legs are). It looks a little tight, but it's not constricting and I can walk in it, so hopefully it doesn't look awful on me. But if it does look horrible, please tell me, so I don't wear it outside of the house! The next item I received was a black short sleeved open cardigan. I love cardigans and wear them all the time. Most of mine are long sleeved, but this will be cute with dresses in the summer. 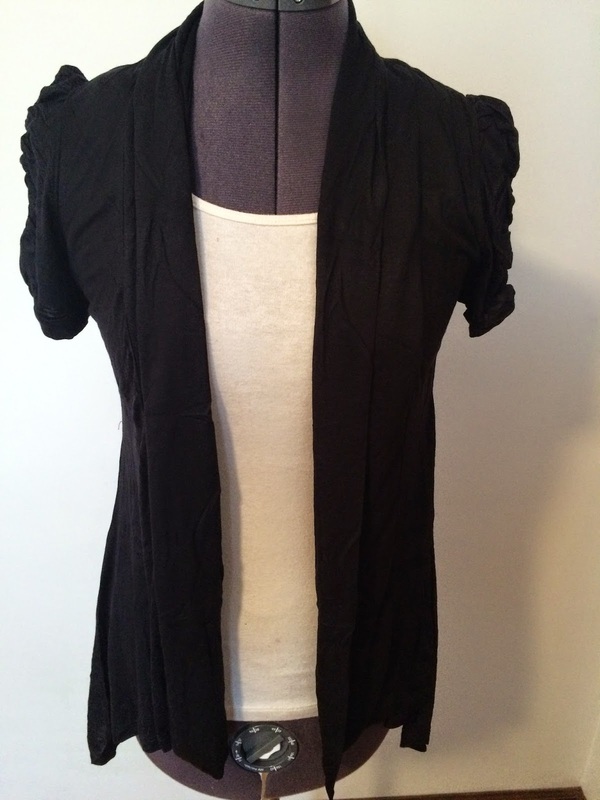 It has a cute hemline, that comes to a long point on the sides and goes shorter in the back. 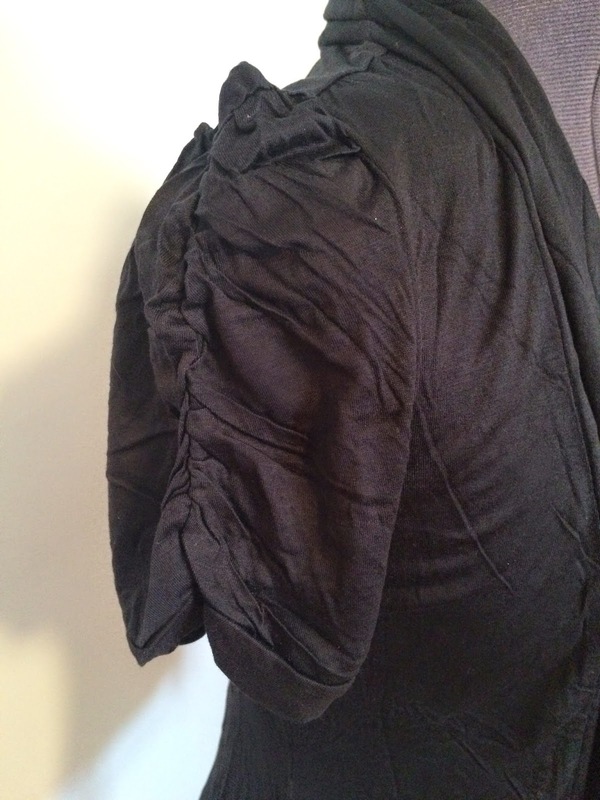 And there is a really cute ruching detail on the sleeves. This was very wrinkled from the box, so the pictures are not the greatest, but it is very nice in person. It's another item I definitely will wear, so far this box has been a huge win for me! The next item I received was a teal maxi skirt. 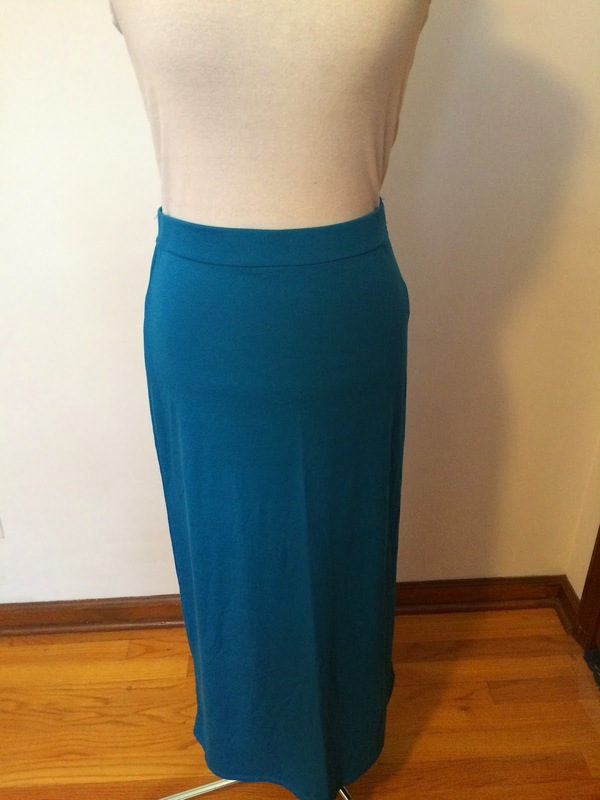 This is a great basic skirt and I love the color. 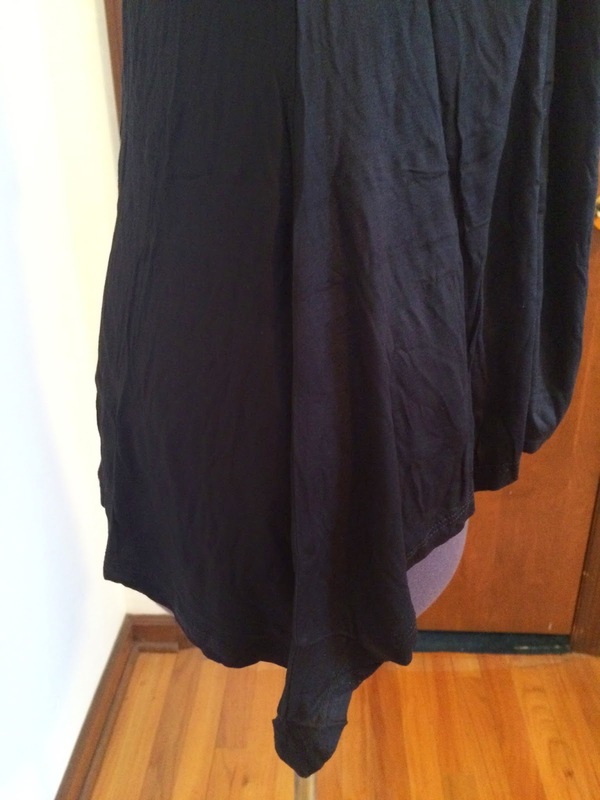 It is similar in color to the first skirt I received, but slightly darker. 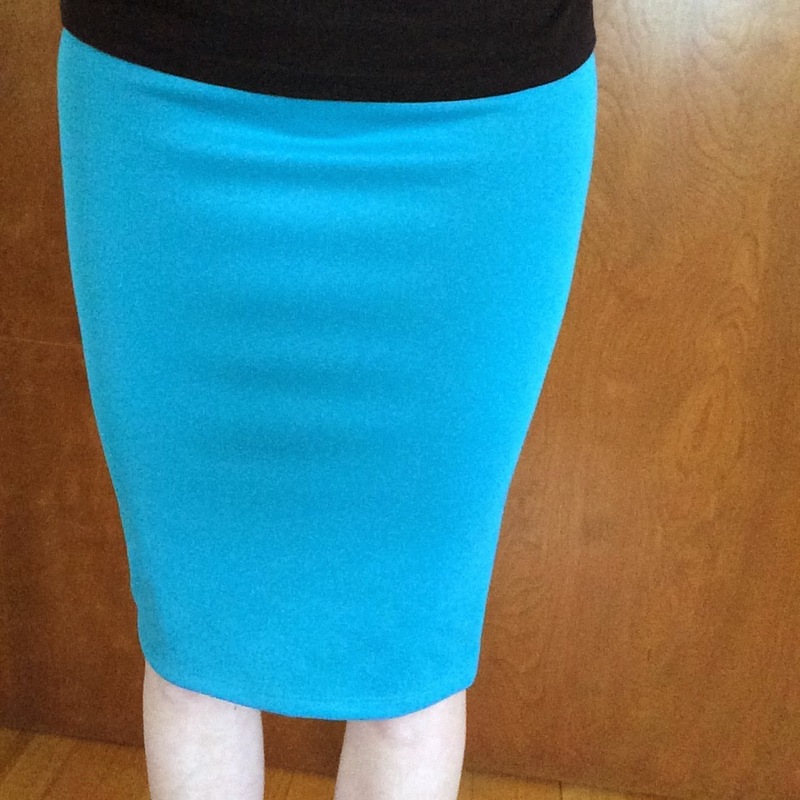 This is definitely one of my favorite colors to wear, so I was happy to see this skirt! It's comfy and cute and will be very easy to wear all spring/summer!!! Another hit! This picture doesn't do the skirt justice, because it's a bit wrinkled, sorry. And the next item was one of my favorites (not that I didn't love everything else), but I'm a sucker for stripes. 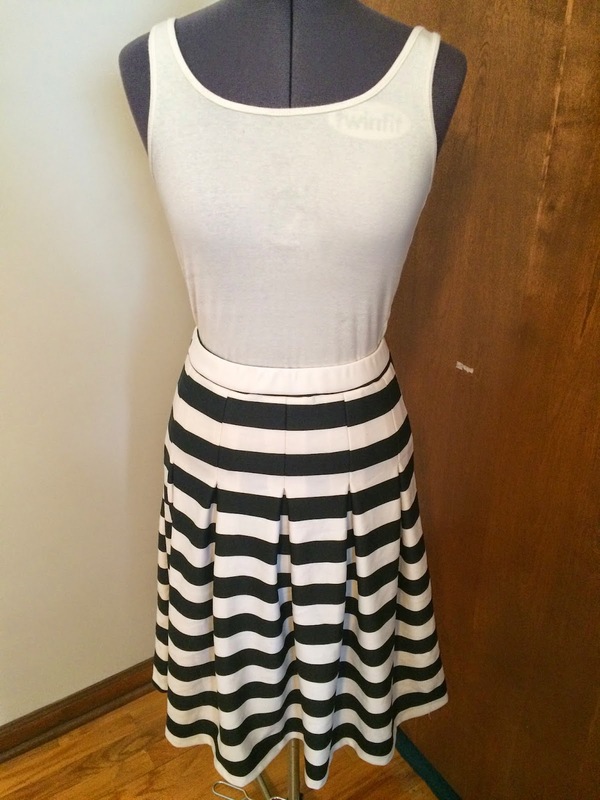 I loved this black/white striped pleated skirt from first sight! It's a heavier skirt, but we don't get much warm weather where I live, so I will most likely be able to wear it all year long (plus I freeze in my office all year long). It hits a bit below my knees, which will be another great length for work. And I love anything with a nautical feel! I will definitely be planning an outfit with this skirt in the near future!!! I feel like this skirt was made for me! And it's another item I would have bought for myself and paid more than $11 for. And the final item in my box, was very exciting! Remember the white tank top I loved in the beginning of this post??? 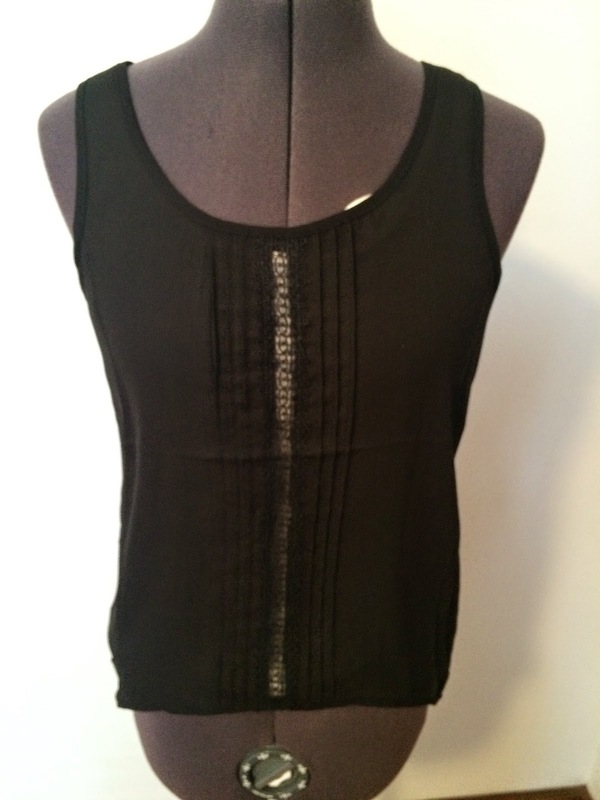 Well, my final item was the same tank top in black! Yay!!! I know I'll wear this tank top in both colors and have actually recently been looking for a tank like this in black. So, this whole box was amazing! I loved everything and everything fit well. And I will wear it all. And I can't get over the price! This was my first purchase from Pick Your Plum, but I already made a few more, because they really do have great deals and cute stuff! If you haven't thought about purchasing from Pick Your Plum before, I say go ahead. It was like someone hand picked this Clothing Grab Box just for me. It was perfect and I loved every single piece and will wear it all! I may try my luck at more, if they offer them for sale in the future. But this is one site you can't hesitate on making a purchase, because things sell out very quickly. If you do decide to check out Pick Your Plum, please use my referral code 25587485 if you make a purchase (there will be a prompt to enter it at check-out)! Thanks!!! * This was purchased and financed by me, unless noted otherwise. Posts may contain referral links and I totally appreciate it when you use them!